Two books from March 12, 2014. Plus your Nerd Confessions (suggested by Cameron Williams about who you trust to recommend new comics). 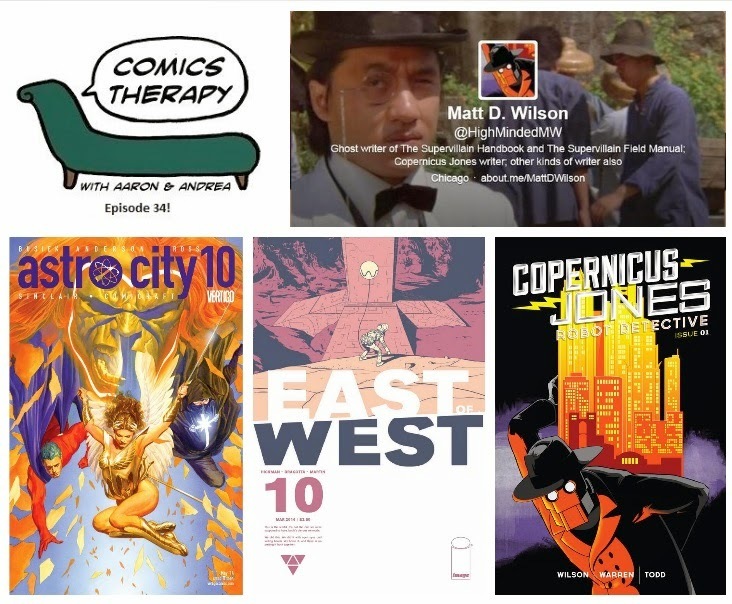 On The Couch: writer Matt D. Wilson. We’ve got trust issues this week, and for once we're not just talking about the hosts. Aaron and Andrea look at a few dangerous characters making shady choices to stay alive, who’d stab you in the back as they whispered sweet nothings in your ear. There's also a great example of one of Andrea's personal favorite character types, the unreliable narrator. So unreliable that he’s not even in this month’s issue. Who can you really trust these days, anyway? Slice of life stories about the citizens and heroes of Astro City. Your guide - occasionally - may be less reliable than you might hope, but at least he is enthusiastic. The story of the Four Horsemen of the Apocalypse, except now there are three. The story of Death, except now he is in love. The story of the end of the world, no exceptions. Matt co-hosts the War Rocket Ajax podcast with Chris Sims, who we spoke to back in episode 28. Under the pseudonym King Oblivion, PhD, Matt wrote The Supervillian Handbook and The Supervillian Field Manual. He writes Copernicus Jones: Robot Detective, published by Monkeybrain Comics. He’s also contributed to the AV Club, Cracked.com and McSweeneys.com.